Burgers are one of my favorite summer recipes – even better when in mini form! These Asian Pork Sliders are layered with a spicy avocado sriracha mayonnaise and topped with a crunchy lime-infused slaw – get ready for an epic slider and recipe for this year’s #BurgerMonth hosted by the talented Girl Carnivore! Burger Month is a yearly blogging event I always look forward to. 2014 was the year of the Dominican Chimi Burgers, a classic from my hometown. 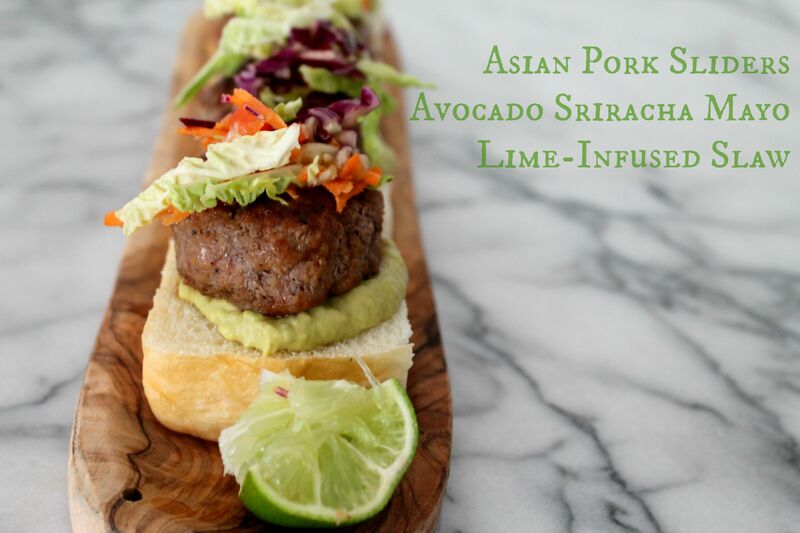 2015 is the year of the Asian Pork Sliders, a twist on regular sliders and a dream of visiting Asia soon! This slider recipe makes 12 perfectly composed sliders, so it’s perfect for 4 people to share. Or just two – because let’s be real, we can eat six sliders easily; specially when topped with a lime-infused slaw and slathered in a smooth avocado sriracha mayonnaise! Don’t those look amazing? Oh and make sure to serve these on Hawaiian rolls – I personally only buy them if I have a specific recipe in mind, because if not, I will devour a 12-pack in 24 hours. Not joking, although I wish I was. A couple of months ago I “treated myself” to a 12-pack and someone eat them all in a day. What is wrong with me?! Serious carb-addict here. But enough about bread, get to cooking up these sliders and let me know how much you loved them! Oh and you can definitely make these in large burger version – just adjust the cooking time and you’ll be ready to go! 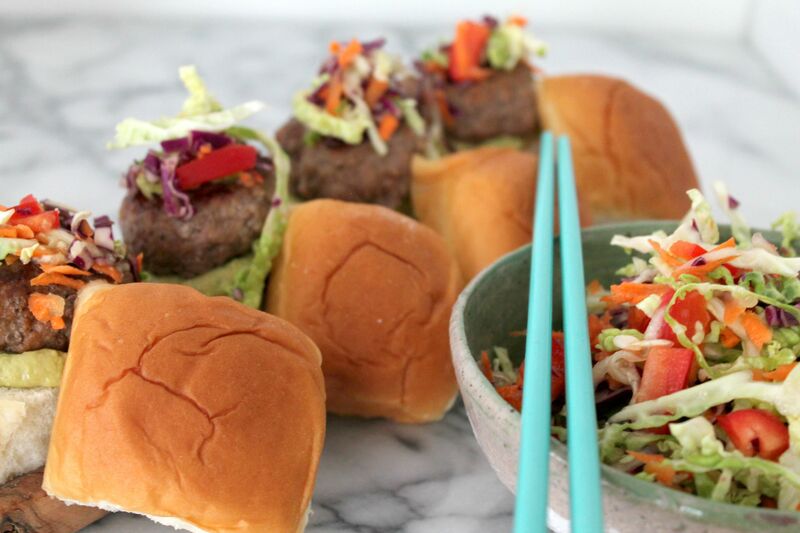 These Asian Pork sliders will become your go to recipe when making sliders - flavorful and packed with fresh ingredients, it's grill time! To make the mayo, whisk together all the ingredients and chill until ready to serve. To make the slaw, toss all the ingredients together with the lime and let marinate for at least 30 minutes room temperature. For the sliders, whisk the clove, teriyaki sauce, sesame oil, sriracha, brown sugar, and salt and pepper until sugar is dissolved. Add salt and pepper, and knead in the ground pork meat. Using an ice cream scoop, scoop even amounts of the seasoned meat onto a tray. Shape into mini-burgers and cook on the grill or stovetop in a cast-iron pan until cooked throughly. Serve on Hawaiian rolls slathered in the avocado mayonnaise and topped with the fresh slaw. 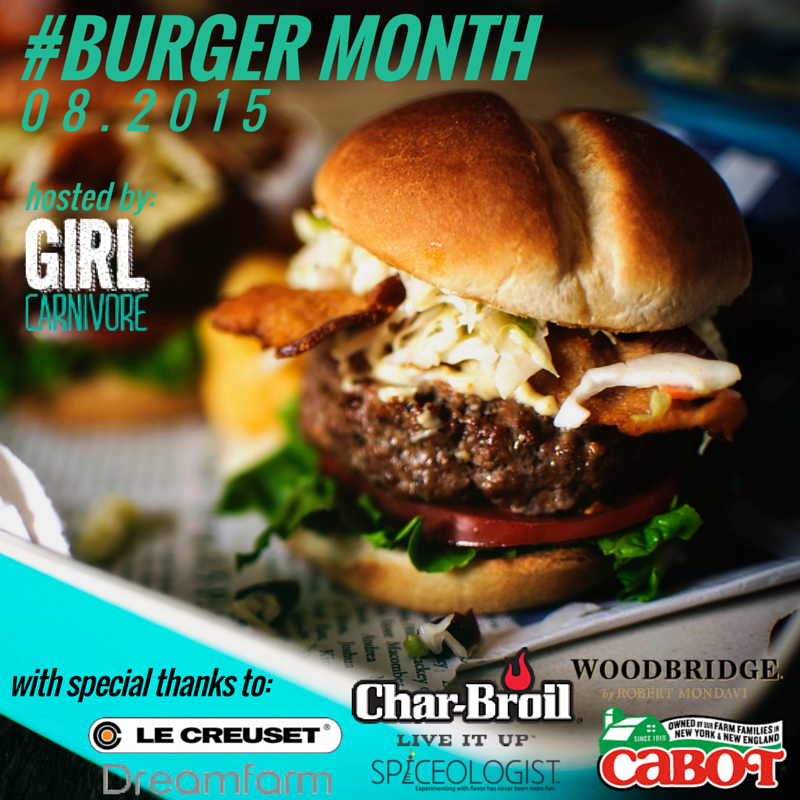 A huge thanks to all of the creative bloggers who were just as inspired by a month of burgers as I was and the awesome companies that have donated prizes to #burgermonth, Char-Broil, Cabot Cheese, Le Creuset, Dreamfarm,Spiceologist, and Woodbridge Wines. I am not sure what part i love most, the super awesome sliders, or Avocado Sriracha Mayo? Cuz that sounds like I could slather it on everything. Talk about danger zone! Thank you so much for making these beautiful kicking bites for Burger Month this year!!! My epic burger creation is a vension burger with some pork or beef fat, eggs, catsup, oatmeal, garlic powder, worcheshire sauce, salt and pepper in the raw mix.